Before we move on to a discussion of engraving techniques, let's consider the types of materials that are available to be engraved on. In this chapter we will explore some of the more common types of engraving stock, how they are constructed and how used. Given the wide variety of choices, a little knowledge about the materials and the applications can help you determine the best cutting technique. Types of materials can range from extruded or cast plastics of many blends, to metals, woods and glass. Almost any ridged material that can be cut by other machining methods can be engraved, or, at a minimum, marked by some method. The type of material you select will often affect the engraving method you use. 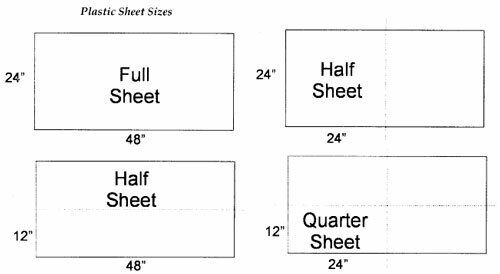 Manufacturers often provide documentation with detailed specifications that spell out suitable applications for the material, methods of cutting and other considerations for use. You can expect to find information about availability, colors, surface finishes, UV stability for exterior use, and recommended cutting depths for just about any type of engraving material. Take the time to ask your supplier for this information. It's generally available in an “easy to read" chart that can be posted in the engraving shop for quick reference. It's important to have a technical understanding about the raw materials that you will most likely encounter when engraving. Due to its overwhelming use I will concentrate on one type of material in particular - flexible plastic engraving stock. A standard full sheet of plastic engraving stock, as supplied by most manufacturers, measures approximately 24" x 48" or (610mm x 1220mm). The sheet will be manufactured of two or more contrasting colored components, a cap layer, or first surface, and a core. The cap layer is the top surface that is engraved through to reveal the core color. Typical thicknesses are 1/32", 1/16", 3/32", and 1/8". Worldwide the 1/16" material is the most popular and serves most engraving applications. Two-ply material consists of the cap and core combination but a three-ply material is available in many colors with a cap-core-cap combination. This allows both sides to be engraved for signs that may be mounted perpendicularly from a wall or hung from a ceiling so that both sides may be viewed. A good example is a corridor sign often found in hospitals or schools. There are several different manufacturing processes used to create the various combinations of colors, thicknesses and textures. Each type of material requires a slightly modified engraving set-up or technique to produce the desired engraving result. There are three basic processes used to create engraving sheet stock: laminated, hot-stamped and co-extruded. Laminated sheet stock is manufactured using a process known as extruding. The extrusion of plastic starts as acrylic resin pellets are melted to a liquid state and forced through a die under pressure. This process can be controlled to yield a sheet of material with a controlled thickness and in some cases a finished texture. The texture is usually a function of one of the roll dies imparting the texture while the material is soft and pliable. Traditionally, both the cap and core materials are extruded and laminated together under heat and pressure to produce the wide range of color combinations and textures. Hot-stamped or micro-surfaced materials are created using an extruded core sheet and applying a thin color foil transferred from a roll to the surface. This thin film is transferred using a hot-stamping machine that applies the film under heat and pressure. This thin cap layer permits very fine detailed engraving because the depth of cut can be minimal-usually as thin as .003" deep will do. Manufacturers using this process can offer a wide variety of surfaces such as granites, metals, wood grains, etc. However, since the surface is very thin, it may tend to fade more easily under UV light and should be considered for interior use. Co-extruded materials are manufactured using the extrusion process; however, both the cap and core layers are produced simultaneously from a single press. When the sheet stock emerges hot from the press, both the cap and core are immediately joined through a set of rollers that presses them together. Before reaching a solid state, they continue through an embossing roll that transfers the final textured surface. This textured surface easily hides fingerprints and has excellent abrasion resistance due to its overall thickness. The cap layer thickness can be controlled to such a degree that fine-line engraving may be accomplished much like that of hot-stamped surfaces. Edge quality - A lower feed rate will produce an excellent edge quality. Bit size - The smaller the bit size the slower the cut speed. A larger bit size will remove larger bits of material, releasing more heat and allowing faster cut speeds. A chip removal system will assist in extracting the chips and prevent them from fusing the cut area back together again. To avoid melting, make sure that the bit is not dull. Try lowering the spindle speed, not the feed rate. Use a single flute bit. The chip removal system will also protect your spindle from clogging up with chips, which can cause overheating of the spindle bearings. If possible, leave any of the protective materials on the plastic to avoid scratching. Most acrylic and Plexiglas materials come with a paper coating for handling. The low tack adhesive used to hold the paper in place will not hurt the cutter. After cutting acrylic, if the edge surface is dull or frosted and will show in the finished product, flame buffing can be done. A small butane torch with a fine flame may be used. The technique takes a little practice to avoid burning or melting. Simply pass the torch flame over the edge a few times quickly to remove the haze and clear up the acrylic edge. Over the years, several different surface finishes have been developed and made popular due to their classy look or ease of engraving. You can choose from textured, glossy, matte, satin, wood-grained and marbled surfaces. Textured stock is often the most easily engraved material and can be used for signs, name badges and surfaces where finger oil or abrasion is possible. I personally like this material for its wide range of uses and ease of cutting. Yet, it does have a thicker cap layer and can make very fine-line engraving a bit more difficult. Glossy materials are used where a high-class finish adds to the attractiveness of the final product. Matte finishes reduce glare and also do a better job of hiding scratches. Satin finishes can be easily identified by the brushed grain surface and are extremely popular with most engravers even though they may sometimes be more difficult to engrave. A common problem with nose riding engraving on satin materials is the shadow caused by the rub of the nosecone. Satins require a bit more care and thought when cutting, and, when possible, non-nose riding engraving. For satin material engraving I recommend reducing the down pressure on the spindle, switching to a plastic nosecone, and leaving the protective coating on during cutting. All of these steps may not eliminate nose rub completely but can help. Wood grains and marble material have the look but not the surface characteristics you may expect. They are basically smooth and can be cut using all of the standard first surface engraving methods. Many new materials are manufactured with the ability to withstand exposure to the elements and are suitable for both interior and exterior use. Materials designed for outdoor use may last for several years before significant cracking or fading takes place. Intense UV light and severe weather conditions will limit the life span of any exterior sign. If you’ve been in the engraving business for any number of years or have access to very old material, you will notice how brittle it can become with age. Many of the lighter-colored materials will yellow from UV light or higher temperatures like those found in the southwest United States. You'll notice that no shelf life is given for any engraving material. No one can predict accurately the useful life of a piece of stock due to the different conditions and climates it can be used in. It’s a good idea to check the manufacturer's specifications before taking a chance with a valued customer’s order.